One of the major recurring challenges experienced by the typical SMB accountancy firm is the dreaded paper trail. Paper documents – such as expense receipts, bills, purchase orders, invoices, etc. – are used for processing payments and handling employee expenses, in addition to performing authorisation and obtaining business approvals. And frequently, everything is stored in paper form, collated and filed in boxes or filing cabinets. This leads to several distinct accounting and business challenges, impacting efficiency, productivity, and data quality. In this blog post, we take a look at three of the biggest pains experienced by accountancy firms cluttered with paper records. In this day and age, paper systems are incredibly tedious. Important institutional knowledge resides within the minds of individuals, while key finance data is scattered across multiple paper copies. It’s easy to see why this format is very quickly becoming obsolete, with a costly, complicated, and inefficient storage structure only adding to the confusion. Maintaining the paper trail – that is to say, collating and filing all of that paper information into some sort of usable format – becomes an almost full-time endeavour, often simply for the sake of doing so. And should the person responsible for the organisation of paper records decide to leave (or simply go on holiday or sick leave), there is no easy way to pick up the reins by either hiring a new employee, or by going down the outsourced accounting route. For either option to work, it first requires a thorough understanding of the existing data and decision-making process. Without this level of insight, it’s difficult (if not impossible) to do anything remotely useful with the data. Beyond the obvious monetary expense, processing paper records can also be extremely costly both in terms of time and effort. What’s more, it inevitably leads to a breakdown of critical processes, causing delay or even complete oversight of business and finance authorisation of important documents. One good example of this in action is the processing of bills. Chances are your company will approve multiple purchases every week and month, typically without any advanced notification to you as an accountant. What follows is an avalanche of multiple suppliers sending multiple bills, often in different formats, that may or may not contain the corresponding data to allow you to match it to a purchase order. You might even find yourself in the dark with regards to who on your side has ordered the goods or services in question. So far, not so good. And now you need to quickly receive approval to pay the bill, otherwise penalties will accrue, and you’ll be the one held responsible! In a paper-based world, finding and reaching out to the relevant business approvers can take time that you do not have; especially considering that both people and responsibilities on the business side can change quickly and often. So, if you’re to pay your suppliers on time, you need to receive executive approval in a timely manner. This means asking your closest executive – sometimes even the CEO – to quickly approve payment release, while at the same time trying to get the relevant department heads to provide additional information about the nature of the bill, verifying whether it was actually approved on their part, and which budget/spending code it should be charged against. In the end, in order to avoid penalisation, this can lead to the bill being paid long before the business approval arrives – or, in a worst-case scenario, the bill is rejected from the business side or changes are requested after payment is made. This clearly describes a reactive finance control process, where all company expenses are being authorised weeks, or even months, after the money has left the bank. And without an adequate level of control over this process, surplus or unnecessary costs can go unnoticed for far too long, slowly eating into the profit margin until you find yourself at a cash flow crisis point. One of the very important aspects of hands-on accounting and finance management is to provide the business executives and owners with a clear picture of the organisation’s financial health. And in doing so, those tasked with it can make the correct business decisions when it comes to managing spending, making smart investments, and to keep the business growing. If you’re left relying on paper-based records, providing such reports can be a costly and time-consuming endeavour thanks to the issues relating to collating and filing. And when combined with the time delays and broken decision-making processes, any reports you can provide will likely be of lesser value because the quality of data available (namely the accuracy and recency) is insufficient. Well, the main reason for the decline in data quality is the loss of business context when finance approvals are made weeks, or months, after the actual transaction took place. In a paper-based system, where business reviews and approvals occur months after the payment, there’s no guaranteed and efficient way of recording the reasons for each transaction. And this leads to generalizations – for example, all transactions are assigned to a generic ‘Other Spending’ accounting code, as opposed to a specific one with more meaning attached. This in turn distorts the financial data and reduces the effectiveness of the accounting process. And the level of insight provided to the executive management team is minimised, impacting important business decisions and, ultimately, the wellbeing of the organisation. The three pains discussed above cut deep into operational effectiveness, but they’re not alone in offering a challenge to businesses and organisations reliant upon paper-based systems. Maintaining hard copies onsite leaves your business open to the possibility that records are lost or damaged, either through mishandling or more catastrophic means such as flooding or fire. There’s no easy way around this, as electing to store paper records off site brings with it the same risks, not to mention a decreased level of efficiency. Speaking of storage, paper records can and do take up a great deal of space. And this challenge will only loom larger as time goes on. Some businesses try to find a solution to this problem by turning a particular floor into a dedicated storage area, but that only leads to more back and forth in pursuit of the right information. The more paper records you produce, the more paper you require. And the costs don’t stop there. You’ll also need more printers, photocopiers, ink, and other related stationery and supplies. If your organisation has designs on presenting itself as being environmentally friendly, then the reliance upon a paper-based system turns into a significant challenge. Both employees and customers often wish to work for or deal with green and sustainable organisations, and the waste associated with paper records could see your business miss out on recruitment targets and sales. Finally, real-time collaboration on paper documents is incredibly difficult. For example, if you need the input of several executives or department heads, you need to print multiple copies of the same document, allow them to make their notes, then sit down together and go through these changes prior to finalising the agreed upon amendments. It’s inefficient, time-consuming, and prone to errors. FIND OUT HOW TO STREAMLINE YOUR PAPER-BASED SYSTEM. For some, traditional, paper-based recordkeeping and finance systems have their advantages. For instance, the security of keeping hard copies onsite and off a network is often cited. However, in today’s fast-moving, modern workplace, the cons more than outweigh the pros where paper is concerned. Cloud-based finance systems provide users with real-time, up-to-date, and accurate information at their fingertips – and not a papercut in sight. Collaboration is made simple with centralised access, and reports offer a valuable base upon which key decisions are made. You can learn all about the many benefits of switching to electronic recordkeeping by downloading our latest eBook. 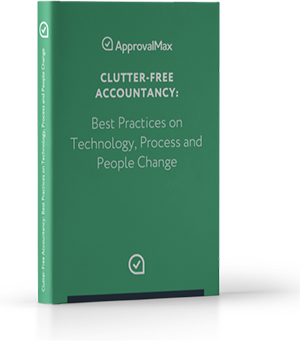 Grab your free copy of ‘Clutter-Free Accountancy: Best Practices on Technology, Process and People Change’ by clicking here.